Baby, You Can Drive This Car. And This Truck. I don’t think we’ve adequately conveyed how awesome vehicular zombie slaughter is going to be in ‘Class3’. Today is the day we rectify that. Here are the basics. There are ten base vehicle types, including but not limited to the muscle car, the wood-sided wagon, the workhorse pickup truck, the hatchback, the little sedan, etc. Each of those basic models has at least one major variant (the little sedan with the aftermarket graphics is also an ordinary little sedan). All of the vehicles come in multiple colors and conditions. That’s not all of the possible vehicles, and definitely not all of the variations. Just whetting your appetite a bit! Not enough for you? Okay. The engines make different amounts of noise. You’ll hear that big truck coming from further away than you will some four-cylinder hatchback (attracting attention from the zombies accordingly). You want to last as long as possible when you drive full speed into a crowd of zombies. As implied, some vehicles have more potential for speed than others. That sports car, for example? It can really move. But compared to that sturdy old truck from the 1970s, driving a sports car down a street filled with debris might not be a bright idea. It’s awfully flimsy. Why else might “flimsy” matter? Because you want to last as long as possible when you drive full speed into a crowd of zombies. Me: So what about hitting zombies? Running into them, running over them. Foge: It is a thing that is fun. We’re using physics to determine how hard you’ve hit the zombies based on your velocity and the angle of impact. Seriously, it’s way fun to watch and even more fun to do. If you hit the zeds when you’re moving fast enough, they die. There are glancing blows, impact damage calculations, and more. You can even open your vehicle’s door while you’re moving and clean a zombie’s clock. But that’s not all. The zombies hitting your vehicle will leave marks, and by marks, I mean disgusting red-black zombie blood. It… accumulates. It is disgusting and awesome. 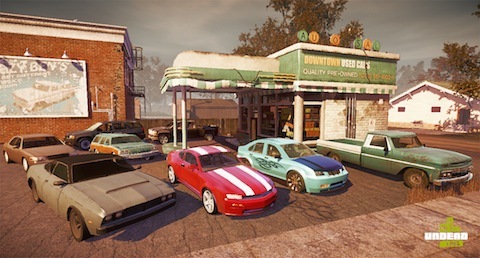 Zombies can cling to multiple points on each car — doors, fenders, tailgates. If you hit one just right, they can cling to the hood. Fortunately, slamming on the brakes oughta send the monster flying. Then you can run over it. It’s not just that, either. Lose the doors, and the zombies might pull you out and throw you on the ground. While the car is still moving. Road rash is not fun, people. You’ll want to be a bit careful. In addition to zombie blood, impacts do damage to vehicles. You can repair that damage, if you’ve upgraded your Home with a parking area and a Workshop. You’ll also need to have rescued another survivor with repair skills. The size of the vehicle matters in general, and not just in terms of passenger space and handling. You’ll be able to drive that hatchback into smaller spaces than you would the big old hulking truck. I know a number of you will ask, so I asked for you: Fuel consumption is a feature that probably won’t make it into Class3 (we’re in the “making hard choices” stage of development, and we’re always going to choose the thing that will be most fun — in this case, we’d rather save the fuel consumption stuff for a later day and make sure you can have fun driving around Trumbull Valley). “You drive the thing you remember driving,” I said. “And smash zombies with it,” he replied. You can see that the cars aren’t exact real world models. That’s on purpose. Everything should feel familiar to you, no matter what you used to drive or where you used to live. The world we’re building is the world you’ve always known. You’ve got to save that world. And drive in it.